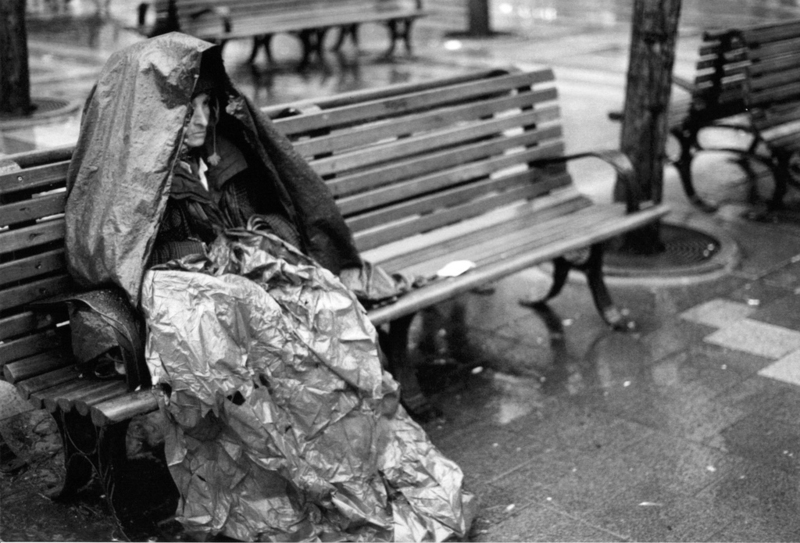 The National Alliance to End Homelessness states that “nearly 4 in 10 Americans are living on the street.” The Alliance also noted that from 2008 to 2009, “the number of unemployed people in America increased by 60 percent from 8.9 to 14.3 million,” and thus this contributed heavily to their homeless situations. Also, Oregon still leads the nation with the highest number of people living without homes, as evident here along the Oregon coast where many hundreds can be spotted sleeping in parks, by streams and on the beach. Gerrity, who admits to “experiencing multiple disabilities,” is one of many local youth who’ve put down their tech gadgets and are, instead, paying it forward by actually getting out on the streets to work with area homeless. For instance, Gerrity is working on something she’s dubbed the “Anutuk Homeless Shelter Project” at http://bit.ly/gzPNbP that’s aimed at helping area homeless find solutions to their situation. “Many homeless people avoid the few existing shelters because of various factors, including prejudicial treatment,” she writes. Local Eugene artist Amy Bowers collects cardboard signs made by Eugene area homeless to help paint a picture that's not invisible to locals, but here now and most serious. A fishy piece of moon scuttled behind the rooftops of a nearby Taco Bell and motel near where Luke “hangs out” in Coos Bay. In a city with a perpetual sulk due to more than two years of 20 percent or higher unemployment, Coos Bay is not the best place in the world to live rough. “I’ve been kicked out of my apartment in Eugene, and my friends over there will have nothing to do with me. I owe just about everyone, and darn if I will ever find a way to pay them back. You see you get so down low – too low for zero as my son Jamie said – that you can’t come up for air any longer. It’s just a waiting game until I kick,” explains Luke who’s wearing a pleated-black coat and nubby old blue jeans. Luke recently got a hand-out, and purchased a bottle of cheap wine. Today, mentally ill people are no longer kept in mental hospitals – if they can’t afford it – and, thus, society must have to deal with them. 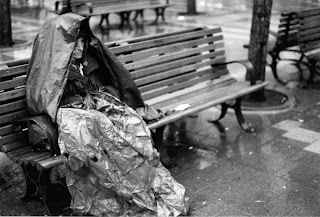 “Many homeless people do not realize how sick they are, and how dependent they are on regular treatment. What we now have are homeless people in need of treatment on the streets,” states a recent report in the American Journal of Community Psychology. Oregon boasts the highest homeless rate in America, and the squatter “towns” that have appeared around nearby Eugene and Portland attest to that, says local activist Mort Saitz. “What we have here is a perfect storm with the recession already in its second year, and no real recovery in site. Add to that the Republican mandate to continue tax breaks for the richest Americans before they will allow emergency unemployment benefits and you have a country without means and heart to tackle the homeless crisis,” explains Saitz who works at various shelters in the central Oregon coast region. According to The National Alliance to End Homelessness, “the recession will force 1.5 to 2 million people into homelessness over the next year. Although homelessness is a difficult number to measure definitively, officials think more and more people – especially families – will be sleeping in shelters, living in their cars and taking up residence in shanty town communities in 2011. Moreover, a recent report out of the U.S. Conference of mayors cites “major increases in the number of homeless in 19 out of the 25 states surveyed, to include Oregon that also boasts the highest unemployment rate in the nation at more than 12 percent out of work. Moreover, a recent U.S. Department of Housing and Urban Development report points to “an estimated 800,000 Americans” experienced homeless in one night recently.